Published in the Internet Newsletter for Lawyers, September 2010. 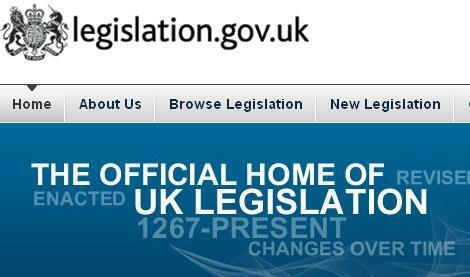 Since late July we have a shiny new official home of UK legislation at legislation.gov.uk. In due course this will completely replace the two current legislation services at OPSI and the Statute Law Database. At present some functionality currently available on the Statute Law Database is not yet available on legislation.gov.uk, including full content search, geographical extent and point in time advanced search options. This functionality will be added in a series of releases and once all features of the new service have been implemented the two predecessor sites will be withdrawn. Already OPSI legislation URLs are being redirected to the equivalent legislation.gov.uk resources. the explanatory notes, integrated with the relevant legislative provisions. The interface provides simple and direct browse access to legislation by type, year and number and simple or advanced searches. Any piece of primary legislation or legislation fragment may be viewed as enacted, as revised (current) or as it stood at any point in time. Any piece of legislation or legislation fragment can be addressed reliably and simply via a permanent URI scheme and any list of legislation can be delivered as an Atom (RSS) feed. From the Browse Legislation tab you can browse legislation by type (eg UK Public General Acts etc) and then by year and number. A dynamic graphic at the top of the listing for each type displays a bar chart of how many pieces of legislation are published for each year. On the initial Browse page, clicking on a geographical area (country) in the map on the right will display just those types of legislation that exclusively or primarily apply to the country and those that may contain legislation that applies to it. Though the graphical elements are attractive and nicely implemented, after the first few visits the novelty does wear off and the graphics intrude. You can view primary legislation as it stood at any point in time from 1991. From the left sidebar, select Latest available (Revised) or Original (As enacted) as needed. The point-in-time features are not yet fully implemented but are substantially present. When viewing particular provisions, select Show Timeline of Changes from the left sidebar. This shows graphically the various points in time the legislation was revised from which you can select the version you require. Alternatively, you can just tag a date on to the end of a URL in the form /yyyy-mm-dd for a point in time view. Using the Search form that is available at the top of every page you can search legislation by title, type, year and number. Using the Advanced Search you can limit your search in various other ways. Full text search is not available at the time of writing and it will be necessary to continue to use the Statute Law Database for this in the interim. From the New Legislation tab you can access lists of new legislation published recently. Listings are offered by type for individual days, and Atom (RSS) feeds are provided for each type of legislation. The changes to legislation facility is not yet implemented. It will provide access to lists detailing the changes made by legislation (primary and secondary) enacted from 2002. The lists will provide details of changes including repeals, amendments, other effects (eg modifications and commencement information). Unfortunately not, though significant improvements have been made to the accessibility of amending provisions. legislation.gov.uk still relies on the same Statute Law Database. Keeping the SLD fully and expeditiously up to date is of course a goal, and the recent merger of the SPO and OPSI editorial teams has provided the opportunity to deduplicate some effort and hence to improve the timeliness of updates, but it remains the case that the editorial work is time consuming and publishing of consolidated legislation will always lag some way behind the publication of amending instruments. There are approximately 5,000 items of revised legislation currently held on legislation.gov.uk and these have all been updated with any changes and effects on them contained in legislation made or enacted at any time before the end of 2002 (or, in the case of Northern Ireland revised statutes, before the end of 2005). Approximately half of all items of revised legislation already incorporate any changes and effects on them contained in legislation made or enacted up to the present. For the remaining items of revised legislation there are changes and effects in one or more of the years from 2003 to the current year that have not yet been applied. A warning notice appears at the top of the Contents list to notify you of any outstanding changes or effects to the item of legislation you are viewing. The changes and effects can then be viewed when you open provisions from the Contents list. Key to the utility of the new legislation service and opening up the information to the public has been the development of a permanent URI scheme for addressing legislation, legislation fragments, versions and related resources. Parts, chapters and schedules are addressable similarly. This scheme is permanent. It will avoid link rot and provides an intuitive format with which any external individual or website can reliably construct an address to any legislative resource. This is not just a technical nicety, but a fundamental improvement that will open up UK legislation for public consumption.